IT WAS called one of the worst industrial accidents in recent times. On Dec 3, a partially built oil rig with 980 workers on board tilted 30 degrees, forcing them to flee - with many jumping into the sea - and leaving 89 injured. 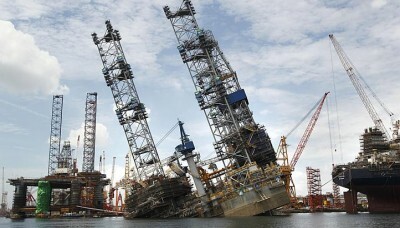 SINGAPORE is the world's biggest player in jack-up rig building, with about 70 per cent of the market. Sembcorp Marine, which owns Jurong Shipyard where the accident occurred, is the world's second-largest rig-builder. The accident thus has the potential to dent Singapore's reputation or hit SembMarine's order books. But investors seem unfazed. The company's share price dipped on the day of the accident but recovered within two days. THE Manpower Ministry's order to stop work at the site has yet to be lifted and investigations by SembMarine are ongoing. The rig remains tilted though the company is working to right it. The rig was originally due to be delivered to an American customer in the first quarter of next year. While its value is not known, previous reports said such rigs usually cost US$220 million (S$268 million). IT WAS a year of tragedy for the Singapore Armed Forces (SAF), with seven servicemen dying in camp or a training area. The tally includes Private Amirul Syahmi Kamal, 19, and Second Sergeant Suresh Seluras, 24, who were both found hanging - the former in a locked toilet cubicle at the Guards camp in Bedok, the latter at Changi Air Base. Corporal (NS) Li Hongyang, 28, collapsed after his 2.4km run in the Individual Physical Proficiency Test in January. Lance Cpl (NS) Tan Tai Seng, 23, died when a tree fell on him. And in what is thought to be the worst non-fatal military accident, Navy regular Jason Chee, 29, escaped with his life but lost both legs and his left arm. He was caught between a motorised winch and a berthing rope onboard warship RSS Endeavour. WHILE each death was a grave loss, the ones which happened during training exercises also raised questions about the SAF's safety procedures and culture. COMMITTEES of inquiry into two of the incidents found clear breaches of training safety rules. Seven commanders were found negligent and redeployed, while investigations continue to see if they should be prosecuted. Private Dominique Sarron Lee Rui Feng, 21, died of an allergic reaction after a platoon commander threw six smoke grenades in a training exercise. The maximum allowed under regulations: two. Third Sgt Tan Mou Sheng, 20, died after his jeep overturned. He had not belted up or worn a helmet. The driver was unlicensed. Investigations continue into several incidents, including the death of Cpl Muhammad Fahrurrazi Salim, 20, who went missing during training in a river in Brunei and was later found drowned. Navy serviceman Chee, a Military Expert 2, is still in hospital. FOR five hours on July 16, flames filled the basement and ground floor of the retail annexe of East Village Hotel in Marine Parade. No one was killed but 11 people were taken to the hospital. BETTER risk management could have prevented the incident, the Manpower Ministry said after initial investigations. The fire is thought to have begun when sparks from upgrading works on the first floor fell to the basement, which had polystyrene boards and cans of thinner and paint. THE hotel, which was undamaged, is set to open next year. It is owned by Far East Organization. MOM and the Singapore Civil Defence Force are still investigating the fire. ON JULY 18, two Chinese national workers died at the Downtown Line Bugis station's worksite under a deluge of wet concrete, after scaffolding above them buckled. It had been supporting a formwork or mould into which concrete was being poured. Eight other workers and nine rescuers were also hurt. Wet concrete rained again on Nov 18, this time from the 15th storey of the Orchard Gateway construction site. The mould it was being poured in had given way. INDUSTRY practice may have parted ways with legal requirements. The Manpower Ministry and Institute of Engineers Singapore said workers should not have been under the formwork at Bugis. But contractors said this is a common practice. The formwork and its support should have been able to bear at least twice the weight of the concrete poured in. But it seems the scaffolding which collapsed was designed to bear just 1.2 times the weight. THE ministry issued a stop-work order for the Downtown Line site, which was lifted on Aug 28. The Orchard Gateway site also had work stopped for nine days. Investigations into both incidents continue. NINE maids fell to their deaths in the first six months of the year, with many cleaning windows or hanging out laundry then. The accidents cast a spotlight on the need to improve maids' safety. NINE deaths in a year is worryingly high, compared to 24 deaths in the past five years. This is despite measures such as a safety awareness course that new maids have had to attend since 2004. More maids coming here are inexperienced, as the veterans are drawn to places with better working conditions, such as Hong Kong. Industry experts have suggested that this could make accidents more likely to happen. IN MAY, the Manpower Ministry launched an orientation programme introducing new maids to high-rise settings. It rolled out safety measures in June, such as requiring home owners to install window grilles and supervise window cleaning. Since Dec 1, employers of new maids have had to sign an agreement to ensure these rules are followed. In May, the Indonesian government forbade new maids from cleaning out-facing windows or hanging laundry outside high-rise homes. Bosses found asking their maids to do so will be blacklisted and barred from hiring Indonesian maids. But lawyers said this would be hard to enforce.